The feast, or solemnity, of Christ the King brings to a close the Christian year. By keeping this feast the Church completes the rehearsal of the story of our salvation which begun last year. In the course of twelve months we have rehearsed the awaiting to Jesus through Advent, we have celebrated his birth at Christmas, we have wondered at the marvellous deed he accomplished during his earthly ministry, we have accompanied Him with sorrow to Calvary, we have rejoiced in the triumph of his resurrection, we have witnessed anew the coming of the Holy Spirit. Today we conclude the Christian year by celebrating Jesus as the beginning, the end, and the centre of all things. The past year has witnessed some horrendous atrocities and natural disasters. It opened with the news of devastation coming from America; it continued with powerful earthquakes in eastern Russia and Japan; then bushfires of vast proportions; more recently we have been shocked by the tragic statistics coming from the Philippines. Intertwined with these natural disasters and personal sorrows we have witnessed to many other atrocities caused by humans; the war in Syria; civil unrest in many other parts of the world; the rise of food poverty in Britain, and yet another terror attack, with the shocking murder of drummer Lee Rigby. Amidst the heart breaking chaos and the morbidly detailed reports of the media nothing seems to make sense even though politicians and religious leaders alike keep on encouraging us to build communities and strengthen our relationships in society. See, I am with you always, to the end of the age. These are the words we ought to remember every time we feel overwhelmed by terrible news, every time we feel disheartened and terrified. Jesus, our king who has conquered death, reassures us and tells us, I am with you at all times. We may not be aware of his presence; indeed some refuse to recognise his presence, and some others still wish for his presence to be dishonoured and forgotten. But the fact doesn’t change; He is always with us, with his Church. There are a variety of ways in which Christ is present with us. As Archbishop Justine and Pope Francis keep reminding us with their examples, Christ is with us in the poor and in those on the margins of society. Jesus is with us through those who suffer; through each other; in his people gathered in prayer. He is with us through Scripture. But there is also another way through which Christ is present to us, the most important way, and this is the Holy Eucharist. In this Sacrament Christ is present with his Body, Blood, soul, and divine nature. In this Sacrament Jesus gathers his Church around himself to create a new community, not one based on goodwill and philanthropy, but based on Him alone. This new community, the New Israel, is called to become the instrument of change and hope for the world, because of the very Eucharistic presence of Christ in her midst. 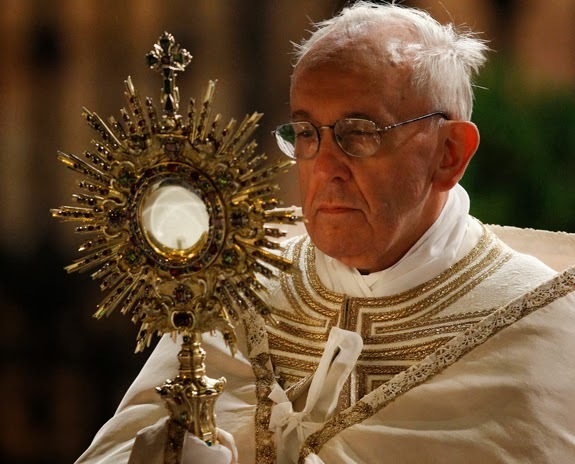 As we conclude this Christian year together, and as we prepare ourselves to welcome the Eucharistic Christ among us for benediction, let us meditate on his powerful words, I am with you always, to the end of the age.